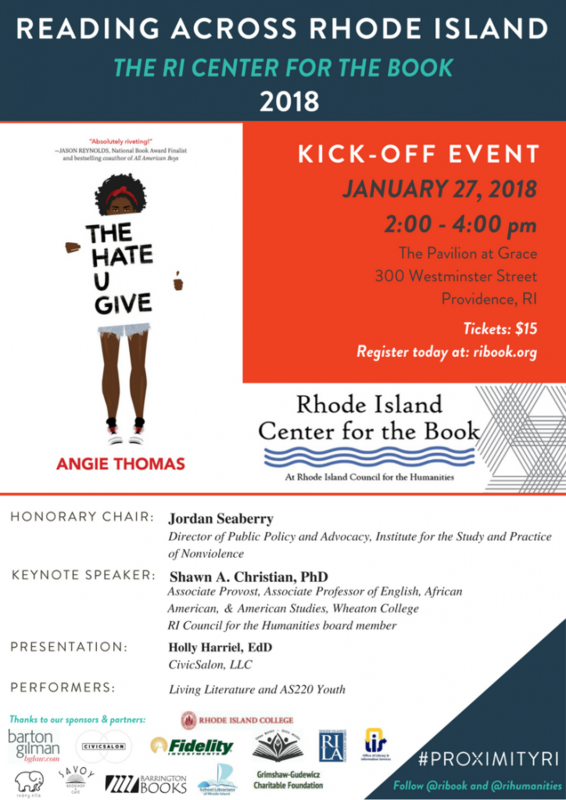 Reading Across Rhode Island, Rhode Island’s One Book, One State community read program kicks off its 16th year by inviting everyone to join in the reading of The Hate U Give by Angie Thomas. Reading Across Rhode Island is a program of the Rhode Island Center for the Book at the Rhode Island Council for the Humanities, made possible through a vibrant collaboration of librarians, teachers, book group leaders and readers from across the state. The 2018 program runs from January through May with readers in Rhode Island classrooms, libraries, community centers, bookstores and book groups invited to join discussions and participate in local community events such as lectures, exhibits and dramatic interpretations centered on this year’s selection. A brave, thought-provoking, conversation-enabling novel about what prejudice looks like in the 21st century. Sixteen-year-old Starr lives in two worlds: the poor neighborhood where she was born and raised and her private high school in the suburbs. The uneasy balance between them is shattered when Starr is the only witness to the fatal shooting of her unarmed best friend. Angie Thomas was born, raised, and still resides in Jackson, Mississippi. She is a former teen rapper whose greatest accomplishment was having an article about her in Right On! Magazine. She holds a BFA in creative writing and can still rap if needed. The Hate U Give is her first novel. Reading Across Rhode Island Kicks Off on January 27, 2018 from 2:00 – 4:00 pm at The Pavilion at Grace, Providence, RI – Register today! Readers are invited to join Reading Across Rhode Island Honorary Chair Jordan Seaberry, Director of Public Policy and Advocacy, Institute for the Study and Practice of Nonviolence and keynote speaker Shawn A. Christian, PhD, Associate Provost and Associate Professor of English, African American, and American Studies at Wheaton College as well as partners Civic Salon, Living Literature, and AS220 Youth for an engaging introduction to the book’s themes. The kick-off event will give book group leaders an introduction to resources and materials provided through Reading Across Rhode Island to catalyze interesting discussions. Early registration for Center for the Book members is now available – get your ticket today! Join us April 12th and 13th for Angie Thomas visits RI! 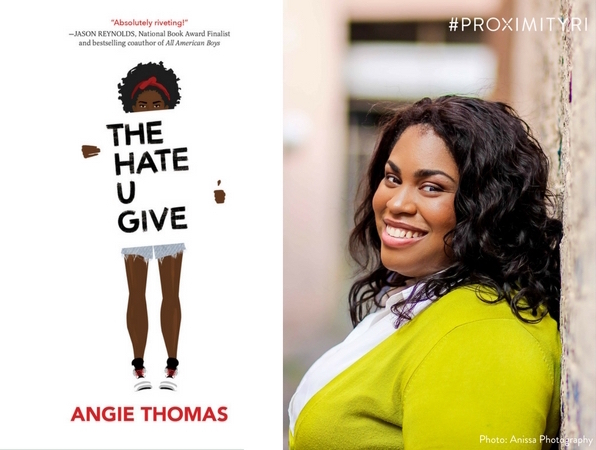 Registration for events with Angie Thomas will be available on the Rhode Island Center for the Book website in February. Look for upcoming book-related events throughout the year at ribook.org. Sets of book are available for loan to classroom teachers, library discussion groups and senior centers by contacting Kate Lentz at kate@ribook.org. Further reading lists, book discussion guides, the author’s website, audio interviews and other supplementary materials may be found on the Center for the Book website. We are so grateful to the businesses that generously sponsor RI Center for the Book programs and to the local bookstores offering 10% discounts to RI Center for the Book members. If you are not yet a member, join today!